FINDLAY, Ohio -- When Hess Corp. filed for a tax-free spinoff of its retail business in January, could dealmakers ever have imagined that the convenience store brand as they knew it would completely cease to exist in just three short years? The iconic bold green and white logo will soon make way for another icon, albeit a Midwestern one: Speedway's red and white logo. As reported in a 21st Century Smoke/CSP Daily News Flash, in a move that gives Marathon Petroleum Corp.'s Speedway LLC ownership of all of Hess's retail locations, transport operations and shipper history on various pipelines for a total consideration of $2.87 billion, the acquisition represents a strategic move for Speedway to push beyond its Midwestern roots eastward. 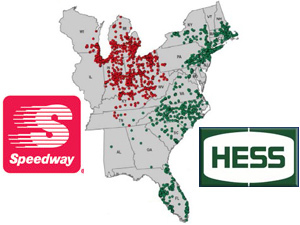 "This acquisition will be transformative for MPC and Speedway as it will significantly expand our retail presence from nine to 23 states through these premier Hess locations throughout the East Coast and Southeast," said MPC president and CEO Gary Heminger. Today, Hess is a global integrated energy company, and a leading convenience store retailer on the East Coast. But in March 2013, the company announced that it would divest its retail operations and focus on exploration and production. It never took the retail arm off the sale block, not even in January when it officially filed to spinoff the retailing network. Enter Speedway. Back in 2013, Heminger commented confidently on Hess' retail assets: "They have one of the best-looking systems on the East Coast," he said during an October 2013 conference call. "It would be an excellent fit with Speedway." Following the acquisition, Heminger is likewise effusive. "This [acquisition] really fits us like a glove and is going to tee us up for long-term growth," he said Thursday on a conference call about the deal. Hess is the largest operator of convenience stores along the East Coast and the fifth largest in the United States by number of company-operated sites, with 1,256 stores located in 16 states. Speedway is the nation's fourth-largest convenience store chain by number of company-owned and -operated sites, with approximately 1,480 stores located in nine states. The total Speedway store count when the deal closes at the end of the third quarter will be 2,733 company-owned stores, putting the company close to the top of the retailer food chain. Tony Kenney, president of Speedway, said that it will make the retailer the largest company-owned and -operated convenience store chain in the country based upon revenue and the second largest by store count. The news will no doubt be an adjustment for the many loyal Hess customers up and down the Eastern seaboard. The brand enjoys sustained popularity on social media, with almost 378,000 friends on Facebook alone. It's also proven itself a hub for the on-the-go eater. And its collectible toy trucks that roll out anew each Christmas spawned a separate press release entirely Thursday. But despite all that goodwill, all Hess retail locations will be completely rebranded within three years. Speedway's leadership structure will remain in place, and the headquarters will stay in Enon, Ohio. "One of the things we'll do is look at best practices between the two [companies]," Angelia Graves, public and state government affairs at MPC, told CSP Daily News. "Some of the things that we look at already from the Speedway side is our merchandise sales focus. We're very much focusing on customers, and the service we're providing for customers. We'll be taking that across the entire platform. And Hess has been a leader in fuel sales in their market. That's a very positive thing that we'll want to continue to develop and expand upon." All aspects of the convenience store, from the fuel canopy to inside the store, from the loyalty program to charitable giving, will be Speedway. On the fuel side, MPC has seven refineries throughout the country. According to Graves, Speedway will be able to place a lot of MPC's product into these new locations. "That's where we start to capture our synergies," she said. "Economies of scale, fuel to the market, customers through our Speedy Rewards program … we will leverage all of those existing practices and assets that we have." But numbers aren't the only things important to Speedway. The fit and synergies between the two companies are also a compelling part of the acquisition. "I think it's going to be a good transition for both Speedway and Hess," Graves said. "They'll both change to become one."